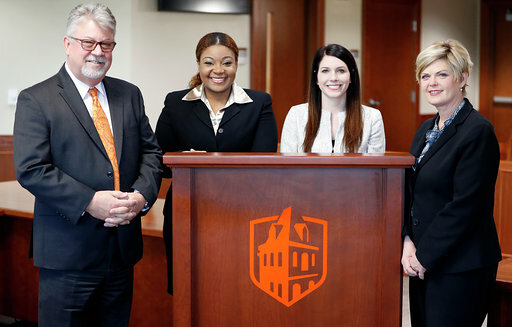 RALEIGH — The same Campbell Law duo — Tatiana Terry ’19 and Katie Webb ’19 — who won the National ABA Client Counseling Championship will go head-to-head against teams from 22 countries at the Brown Mosten International Client Consultation Competition on April 3-6 in Dublin, Ireland. Campbell Law Dean J. Rich Leonard has announced the Law Offices of John M. McCabe, PA is generously sponsoring the team. Brown Mosten ICCC is an annual event for the winners of national competitions across the world; providing an opportunity for students to learn and practice interviewing and counseling skills as well as to meet lawyers from other nations and cultures. The Campbell Law team is coached by Professors Melissa Essary and Jon Powell. They help Terry and Webb prepare for the fundamental skills that the Brown Mosten ICCC will test; namely the ability to interview, counsel, and support a client through a hypothetical legal issue. Students are called on to explain various aspects of the attorney-client relationship, build rapport, determine client goals, and consider applicable law and options that may be available to the client. Over the past 10 years, students from 33 countries have competed in Brown Moten ICCC, including Australia, Bangladesh, Belgium, Cambodia, Canada, China, Croatia, England and Wales, Finland, Georgia, Germany, Hong Kong, India, Indonesia, Iran, Irish Republic, Jamaica, Kenya, Malaysia, Mexico, Netherlands, New Zealand, Nigeria, Northern Ireland, Poland, Puerto Rico, Russia, Scotland, Sri Lanka, Switzerland, Turkey, Ukraine, and the United States. On March 23, the duo of Terry and Webb beat out 108 teams from 69 law schools to take top honors at 2019 National ABA Client Counseling Championship — a first for Campbell Law. It was the second historic national championship team Terry had competed on in as many weeks. On March 16, she and her third-year teammates — Nichad Davis, Maurizo Lewis-Streit, and Ashley Urquijo — were crowned National Champions of the National Black Law Students Association (NBLSA) Mock Trial Competition on March 16, in Little Rock, Arkansas. It was the law school’s first national championship in the competition.